NCI's popular patient education publications are available in a variety of formats. Download one or more of these booklets to your E-Book device, smartphone, or tablet for handy reference, or open them as a PDF directly in the browser. Explains what clinical trials are, why they are essential to improving cancer care, how the safety and rights of participants are protected, who is responsible for which costs, and potential risks and benefits of taking part. Explains what tissue donation is and covers things you should know and think about when deciding to donate your tissue to research. Tissue can include materials from your body such as skin, hair, nails, blood, and urine. Explains the importance of tissue donation, addresses potential concerns, and encourages patients to speak with their healthcare provider about donating samples. Covers things you should know when deciding to take part in a clinical trial that may help find ways to prevent cancer. Covers the choices for care and symptom control for the patient with late-stage cancer, along with the emotional and communication issues it brings. Covers the feelings and concerns of people with cancer and their families. Covers the physical and emotional issues related to having a cancer recurrence. A condensed version of “When Someone You Love Is Being Treated for Cancer,” it covers practical, coping, and communication tips for friends and family members caring for loved ones with cancer. Covers practical, coping, and communication tips for friends and family members caring for loved ones with cancer. Covers coping strategies and communication tips to address the concerns that cancer caregivers face when their loved one has been told that he or she has advanced cancer. Explains next steps after an abnormal Pap or HPV test result, including how cervical conditions are diagnosed and treated – as well as information about screening guidelines and HPV vaccines. Explains prostate cancer symptoms, risk factors, the PSA test, and other prostate conditions including BPH and prostatitis. Covers the different ways of volunteering or becoming involved in cancer-related activities. Explains what chemotherapy is and discusses questions people may have, such as how often they will have treatment and how it will be given. Explains common side effects, why they happen, ways your health care providers can help you manage them, and tips for managing them at home. 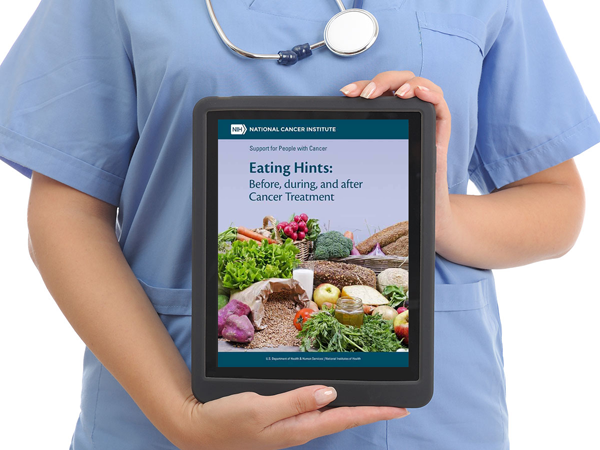 Covers how diet needs differ for people with cancer, common eating problems that may occur, tips for handling food safely during treatment, how health care providers can help manage eating problems, and tips for managing problems at home. Covers pain control medicines for cancer patients, pain control plans, talking with your health care team about pain, and coping with the physical and emotional effects of pain. Covers side effects that patients may have during radiation therapy and ways to manage them. Get answers to commonly asked questions about chemotherapy using this interactive pamphlet. Learn what to expect during internal radiation therapy, also called brachytherapy, and get answers to commonly asked questions. Learn what to expect and get answers to commonly asked questions about external beam radiation therapy. Covers the treatment options for early-stage prostate cancer, such as active surveillance, surgery, and radiation therapy, and helps men decide which treatment is the best for them.